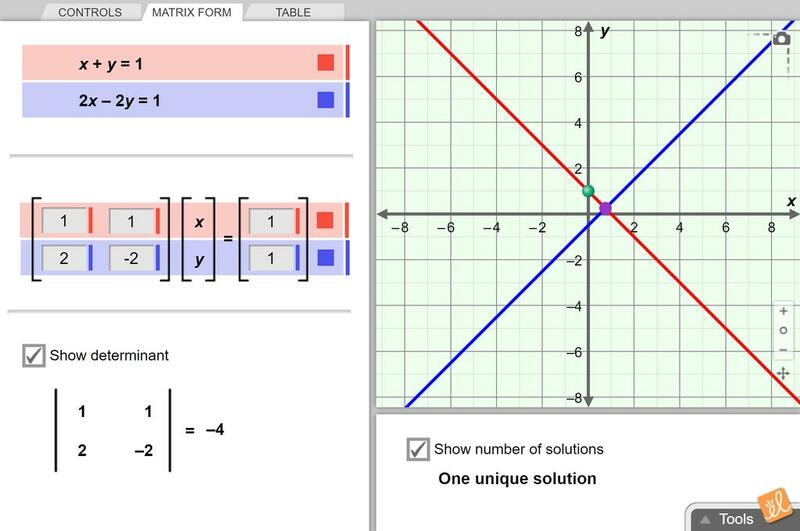 Explore systems of linear equations, and how many solutions a system can have. Express systems in matrix form. See how the determinant of the coefficient matrix reveals how many solutions a system of equations has. Also, use a draggable green point to see what it means for an (x, y) point to be a solution of an equation, or of a system of equations. This a second set of five assessment questions. Two quesitons involve visuals which might be good for yo... (more)ur visual learners. This exploration guide is meant to be an introduction to the topic of solving linear systems. Therefore ... (more)it does not go into as much depth. Specifically it does not include the activity in which one of the equations is replaced with the sum of the equations.